Today in Masonic History Philipp von Stosch is born in 1691. Philipp von Stosch was a Prussian antiquarian. Stosch was born on March 22nd, 1691 in the Küstrin in the Neumark region of Brandenburg which is today Kostryzn, Poland. His father was an artist and the Mayor of Küstrin. When Stosch turned 18, with his father's blessing, he started a tour of Europe. This ended with Stosch settling in Rome. 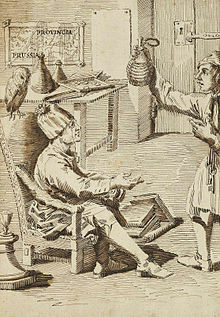 In Rome, Stosch became a well known and well connected collector of engraved gems, books, manuscripts, early engravings and drawings. His connections included Alessandro Albani, who was a cardianl nephew of Pope Clement XI. A cartidnal-newphew is someone who is appointed by a Pope because of a family relationship, often an uncle. Stosch financed his business by some very unusual means as well. One of which was becoming a spy for the British Governement against the Jacobite court. When he was revealed as a spy in 1731 he was forced to leave the papal states due to the close ties of the Jacobites with the Catholic church. Not even Stosch's close realtionship with Albani was able to protect him. Stosch continued his collection in Florence where he fled. He continued to acquire a variety of items and encouraged contemporary artists including Johann Lorenz Natter a German gem engraver. Stosch also was responsible for making the monocle fashionable. Stosch passed away on Novermber 7th, 1757. When Stosch fled to Florence he helped to start a Masonic Lodge there in 1733. The lodge is significant because it led to the first Papal ban on Catholics becoming Freemasons by Pope Clement XII. In 1738, Neri Corsini a cardinal-nephew of Pope Clement XII stated in a letter that the ban on Freemasonry was not due to an ideological objection, instead it was a claim that the lodge was corrupt. Some sources also claim that Pope Clement XII tried to join the lodge before condemning it and was refused as a petitioner, although no evidence of this exists. No matter the reason for the ban, at the time Stosch's house became a center for spiritual inquiry of Rosicrucianism. The lodge was closed in 1738, possibly 1739, when Tommaso Crudeli, who was a Florentine free thinker was arrested and imprisoned by the Roman Inquisition.